Recently, I visited Málaga again. My first time was some five years ago as a chaperone to a group of teenagers. Not exactly the perfect conditions for slow travel. This year I went with my Mom for a week, starting with the Good Friday. We had the freedom to do whatever we wanted and spend as much time as we needed in every place we visited. I was lucky to witness the Semana Santa celebrations and processions but I also had a chance to revisit Alcazaba. Five years ago we had to go pretty quickly through it (and with my eyes all around my head to see if kids were behaving) and we skipped the Gibralfaro. This time, we took our time and made sure to walk also to Gibralfaro. When you visit, you have the option to buy tickets to both of those places or choose one of them. 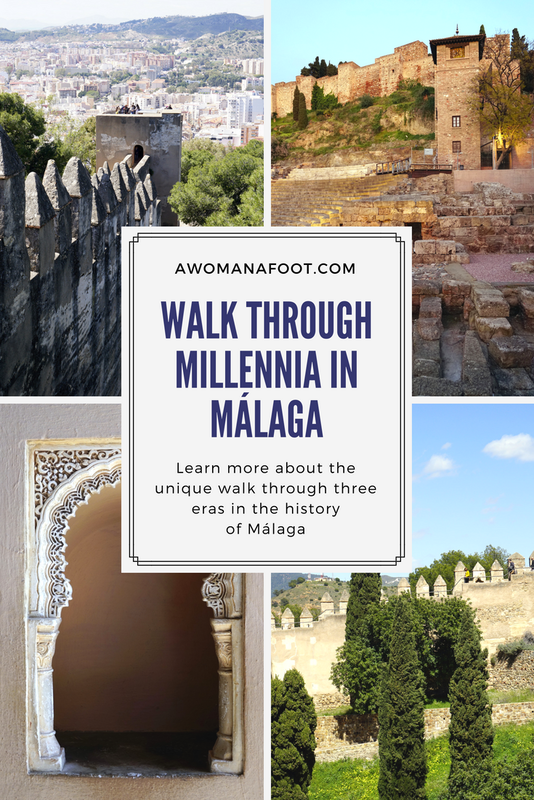 Although they are not linked by common theme or style, coming from different times and serving somewhat different purposes, they are the two main stops on Málagahistory tour. By chance we bumped into the new, side entrance to Alcazaba. I had no idea there was one and it was a lucky chance as there was an elevator inside. I highly recommend it as the walk up to the top is quite steep. Do you like my photos? Click on the image below to see the best of them! From the photos below you can see why I was happy to visit Gibralfaro - although Alcazaba provided amazing views over the town and to the sea - Gibralfaro is higher and gives much more diverse vintage points. Even though both of those places have unique styles and history, one needs to see both, to have a better picture of the history of Málaga. Being one of the oldest cities in Europe, boasting over three millennia of history, Málaga is the perfect destination for all history buffs. We can't see much of the oldest layers - from the times of the Phoenicians (although the ancient name is preserved in modern "Málaga") but we can admire what is left from three epochs of history: Roman, Muslim, and Catholic rulers. All three can be seen very close to each other - walking towards Alcazaba we pass the Roman theater which stones and columns were used by the builders of Alcazaba, towering above the the ruins. After a walk through the Moorish castle we can then take the hike up to Gibralfaro, to complete our trek through history. Alcazaba is a really beautiful structure, although for anyone who has seen the Alhambra, it stays in the latter's shadow. Still, there are beautiful details all around and the stunning greenery adds to the ancient stones' beauty. I visited Málagain spring - probably the best time possible. It was wonderfully warm without being hot, all nature was in full bloom, filling eyes with colorful beauty. As I came to Málagawith my Mom, who has some mobility issues, I could slow down and take all my time to take photos, see whatever there was around me. And as my Mom had to rest often, it was a great opportunity to sit and enjoy a view - such a rare thing for us, tourists, running from one site to another, out of fear of missing out. Thanks to my Mom, I accepted it was OK to not see everything, to spend more time drinking in just five accidental views or sceneries instead of fifty. Although sometimes my anxiety to do all the photos won over and I ventured on my own to see another narrow path or check what was behind a curve. When we were walking through Alcazaba, I tried to imagine what it was like to live there, back in the day. All the water fountains, canals and little streams helped with the heat of the Andalusian climate. The beauty of the well taken care of gardens must have been the perfect backdrop for leisurely strolls and lovely conversation. As well as for dark political planning and cruel decisions. When we moved to Gibralfaro, the difference in styles was striking. Gone were all the beautifying details, flowers, gardens or decorative elements. Gibralfaro was a military base and didn't try to hide it in any way. Stone walls and countless stairs circulated the hill providing modern day visitors with unparalleled views in all directions. The walk up can be tiring - especially for someone like my Mom but we made it. There is a lovely cafe inside and we could rest and re-energize with a proper cup of delicious Spanish coffee. Find your accommodation in Malaga today! The day was really hot (I can't imagine walking those places in July or August) but we made it all around the narrow paths along the high walls. The stairs were often awkward and too high, causing my Mom some problems, but she's the tough one, so did them all. I really enjoyed walking all those narrow corridors, visiting tiny round sentinel structures or side towers and round barbicans. Even though Gibralfaro is far from "beautiful", I really liked the rough, brutal structure. The exposed brick and decaying plaster provided rich texture and a kind of vibrancy to the views. In particular I loved the juxtaposition of the old, brutal form of the walls with lush greenery of views to the lovely Málaga's suburbia. I am so glad I could go back to Málaga. This town is just such a pearl and worth giving her some of our time. I had much more time to just walk around the town, watching all the lovely balconies and charming buildings. Listening to the chit-chat of people in countless bars, cafes and restaurants. Have you been to Málaga? Which part of the city did you like the most? Sagrada Familia: No, It's NOT Overrated & Yes, You MUST See It!